A research team consists of scholars from Taiwan and China has developed a microscopic imaging system for inspecting Micro LED display surface luminance. Currently the major luminance measurement systems focus on inspecting the total luminance of LEDs which do not meet the requirement of Micro LED as the luminance of each individual Micro LED chips need to be evaluated. To solve the issue, researchers from Xiamen University in China and National Chiao Tung University in Taiwan proposed a method to accurately inspect the luminance of a whole micro-LED array and the surface luminance distribution of single Micro LED chip on the array. The camera-based microscopic imaging system integrates a high-precision complementary metal oxide semiconductor camera and a self-made data processing algorithm. 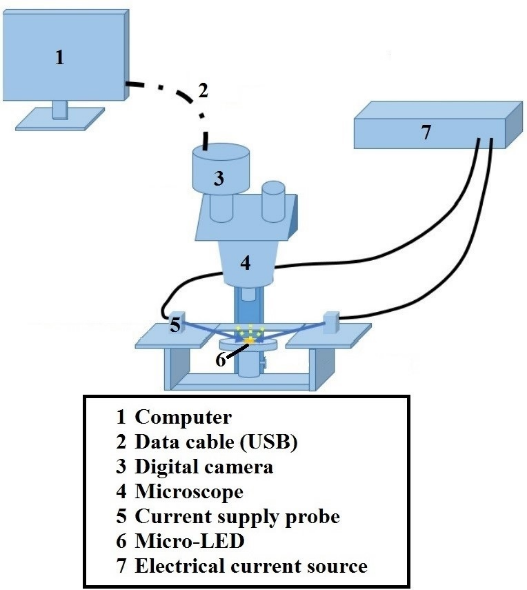 Combining a computer, electrical current source, digital camera, current supply probe, and microscope with supporting software, the system can capture and analyze the photomicrograph to measure the luminance of Micro LED chips. According to the research, the experiment results show that the maximum error of the luminance measurement is less than 8%, which proves the accuracy of the method. The metrical wavelength range and the accuracy of system can be dynamically set according to the camera and microscope. With a wide wavelength range, the measuring system is capable of evaluating the spatially resolved distribution of luminance for Micro LEDs. The result of the research was published on IEEE Access in September 2018.